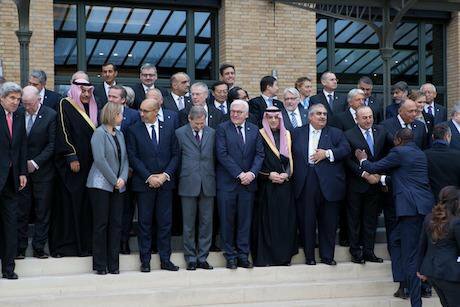 More the 70 countries participated in the Middle east peace conference in Paris, France. Picture by Ania Freindorf Zuma Press/PA Images. All rights reserved. If the international community, led by the U.S., is serious about preserving the two-state solution to the Palestinian-Israeli conflict, the upcoming French-hosted international peace conference is a once-in-a-lifetime opportunity to reframe the way forward. Recognizing the State of Palestine would politically contribute to ending Israel’s nearly 50-year military occupation of the West Bank, including East Jerusalem, and the Gaza Strip. This single act may be the silver bullet to save the two-state solution. Such an act would acknowledge the asymmetric balance of power on the ground and finally acknowledge in law—prior to a peace agreement—that the international community envisions the end-game ultimately being two states. This could serve as a platform for future actions to engage both parties to act in their internationally-aligned strategic interests. Anything less, or muddying the waters by including this move in a basket of other issues, would likely further delay a real Middle East Peace Process. In Secretary of State John Kerry’s recent remarks on Middle East Peace he took pride that “the United States recognized Israel seven minutes after its creation” in 1948. This recognition of Israel happened without Israel having a defined eastern border, a supposed prerequisite for statehood. Is it too much to ask the U.S. to support the recognition of the State of Palestine in the same fashion, without a defined western border? This is exactly what the Palestinian’s request for full UN membership to the UN Security Council in 2011 stated, recognition with Palestine’s western border being “on the basis of the pre-1967 borders,” which is “in accordance with the relevant [UN] resolutions,” along with the need to “resume and accelerate” negotiations of our shared border with Israel. When the U.S. threatened to veto the 2011 application for full UN membership, the Palestinians, in a strategic move, requested that it be sent to a UN Security Council committee for further deliberations pending a more opportune timing. The following year, on 29 November 2012, a General Assembly resolution was passed that "decide[d] to accord to Palestine non-member observer State status" and "express[ed] the hope that the Security Council will consider favourably the application submitted on 23 September 2011 by the State of Palestine for admission to full membership in the United Nations." The majority of the world’s countries have unilaterally recognized the State of Palestine and 138 countries upgraded Palestine’s UN status when they voted in favor of Resolution 67/19. Despite Israeli Prime Minister Benjamin Netanyahu’s total rejection of the international community’s efforts to attempt to save the two-state solution, France is preparing to receive some 70 countries on January 15 to convene an international Middle East Peace Conference which aims to preserve the two-state paradigm. Palestinian President Mahmoud Abbas has welcomed France’s effort, but for the average Palestinian the news of yet another conference on Middle East peace is like making a groundbreaking announcement that Starbucks sells coffee. Those living under the daily brunt of Israeli military occupation are right to be skeptical. There is a long list of failed peace efforts all the way from UN General Assembly Resolution 181 (II) Future Government of Palestine (November 29, 1947), Count Folke Bernadotte proposals (1947-1948), UN Security Council Resolution 242 (November 22, 1967), the Rogers Plan (1969), UN Security Council Resolution 338 (October 22, 1973), the Reagan Plan (Sept. 1, 1982), the Oslo Accords (1993), Wye River Memorandum (October 23, 1998), Camp David 2000 Summit (2000), The Clinton Parameters (December 23, 2000), the Taba summit (January 2001), the Tenet Plan (June 13, 2001), the Arab Peace Initiative (March 28, 2002), the Road Map for Peace (April 30, 2003), the Sharm el-Sheikh Summit of 2005 (February 8, 2005), the Kerry Principles for Middle East Peace (December 29, 2016) to name just the main efforts and, sadly, the list seems likely to grow. To avoid being added to the above list, the upcoming international conference should collectively take the single act of backing a UN Security Council resolution recognizing Palestine. Once Palestine and Israel are both recognized, the countries of the world could start to apply international conventions, treaties and understandings—just as they apply to all bordering states around the world—to the daily hurdles (from movement and trade to the use of airspace and electromagnetic spectrum) facing Palestinian existence under Israeli military occupation—as well as differentiating their own dealings with pre-1967 Israel and its illegal settlement enterprise. Given the upcoming “Trump era,” the recognition by the international community of the State of Palestine before it is too late could do much more than “laying down markers.” Such a move could be used to finally hold Israel accountable and levy serious costs—political, economic and otherwise—on Israel to bring it in line with international law and UN resolutions, not to mention common sense. If the two-state paradigm fails, Palestinians and Israelis will not vanish into thin air. While Secretary Kerry’s 2014 nine-month thrust to restart negotiations was collapsing, the Bruno Kreisky Forum for International Dialogue in Vienna undertook a serious intellectual exercise with Palestinian, Israeli Jewish and European intellectuals, politicians and activists, to contribute to re-examining the current strategies and paradigms, proposing and exploring new perspectives, visionary discourses and alternatives to partition. A volume was produced along with the Group of the Progressive Alliance of Socialists & Democrats in the European Parliament, titled, Rethinking the Politics of Israel/Palestine - Partition and its Alternatives, which proposes out-of-the-box thinking on the Israeli-Palestinian conflict. In politics no vacuums exist and this effort reflected just that fact. If the upcoming January gathering of states fails, the French could just sing C'est la vie as Netanyahu laughs all the way to the next settlement in the West Bank, but yet another generation of Palestinians and Israelis on the ground will pay the ultimate price for their failure. This article was first published by the The Huffington Post on January 14, 2017.